The photo Tim ‘Skippy’ Miller selected for his Facebook profile is certainly not one that I would choose for myself. First of all, he is upside down. His hair is messy, his eyes are bulging and his tongue is sticking out. It’s hard to tell whether he used Photoshop to rotate his image or the photo was taken while he was skydiving or falling off a cliff. With Miller, anything is possible! What I do know is that ‘Skippy’ is the ultimate extrovert. This Courtenay-based amateur paleontologist has more than 600 kooky self-portraits like this one on his Facebook page—who knew the human face could contort in so many different ways?—and close to 3,000 ‘friends’ from around the world who know him as the fun-loving fossil freak from Vancouver Island, British Columbia. It was on a subsequent Puntledge River tubing adventure that Miller found his next fossil. This one, he says, literally rolled down an embankment and fell into his hands. The 80-million-year-old heteromorph ammonite—a fossilized squid-like sea creatures that looks a bit like a snail—measured about 10-centimetres across and had lots of pattern and glitter. The rest of the Miller’s story, quite literally, is ancient history. I urge him to tell me the story behind the ‘Skippy’ moniker. He is right. The story is not suitable for publication. You do not need to know. Trust me! Miller explains: “I was born in Germany in 1966. My father, Charles ‘Dusty’ Miller, was a firefighter with the Royal Canadian Air Force. So, that makes me a military brat. My family moved to CFB Cold Lake in 1967 and then to CFB Comox in 1973. As Miller tells me about his father, it becomes obvious that he inherited his wacky sense of humor and zest for life from his dad. He explains that his mother, Leona, may not have always liked the “screwball adventures” they went on but supported Dusty and the boys as long as they were having fun and trying to stay safe. For the record, Miller points out, his brother Percy Miller is a freak, too. “But he is a fishing freak,” he adds with a laugh. In order to fund his fossil excursions and provide for his family, Miller has worked as a roofer for Nelson Roofing for more than 20 years. He has also worked the nightshift in the warehouse for Canadian Bread for about nine years. Bryanna is a homemaker, an Epicure products representative, a Scout leader—all three of the girls are enrolled in Scouts—and, quite likely, a woman with the patience of a saint. When he’s not working or being a family man, Miller can be found searching river bottoms and rocky shores or hiking on the mountainside cliffs, road cuts and quarries of Vancouver Island and the Gulf Islands. Outfitted with protective goggles, a hammer and chisel, and an effervescent sense of excitement, Miller looks forward to weekly outdoor excursions in search of the next great dinosaur discovery. Often, his girls and the dogs join him for the adventure. “I love fossil hunting because with every tide change on the beach or heavy rainfall and subsequent erosion along a riverbank or mountainside, there is always the possibility of new fossil remains being uncovered,” explains Miller. In the last 18 years, Miller has discovered thousands of fossils. Every single one is carefully analyzed and identified. Since his wife has declared a moratorium on any more ‘rocks’ coming into the house, he now has a storage locker filled with paleontological treasures. He loans the fossils to museums, trades them with other fossil collectors, and uses them for demos and displays. Miller adds that although it is not illegal to sell fossils, it is considered unethical. Miller explains that Vancouver Island is a virtual treasure chest of fossils with everything from dinosaur teeth to ancient crustaceans (hard-shelled aquatic animals). The waters around here were once home to eight different species of pre-historic crabs, three types of lobsters, dozens of ammonites that ranged from loonie-sized to more than a metre in diameter, and much more. 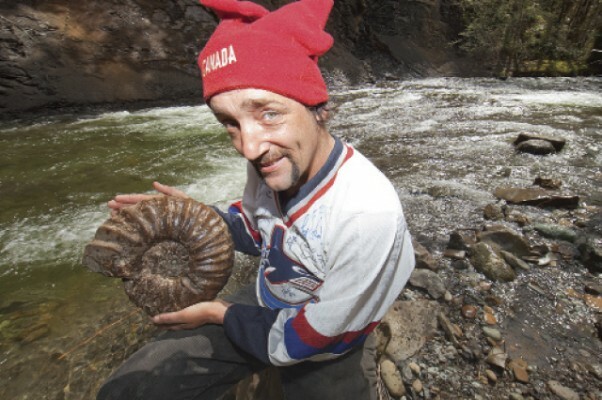 Miller says that some of his friends once discovered an impression of a huge ammonite in a riverbank at a “secret location.” When they went back for a second look the river had washed much of it away. Always interested in learning more, this self-taught, amateur paleontologist says his that West Coast Fossils is his reference “bible.” If he finds something that he cannot identify, he heads down to the Courtenay & District Museum to consult with experts there. He also uses the Internet to network with other amateur and professional paleontologists from around the world. In 2010, accompanied by fellow fossil freak and former sidekick, Peter Bryant, the duo video recorded 19 Fossil Freak Show episodes and posted them on YouTube. Exposure on the Internet has garnered Miller a network of cyber-space connections and supporters, many of which send him odd and unusual free gifts. “A guy from Australia once sent me a dehydrated kangaroo scrotum!” exclaims Miller. “Look!” he says as he jumps up to point it out amongst a myriad of other cherished possessions proudly showcased in a glass curio cabinet. Other prized gifts of appreciation/admiration include a fossilized dragonfly from Germany, a pinecone from Argentina, and a whimsical piece of art that depicts Miller dancing on a beach in the moonlight. His #1 fan, Minneapolis, Minnesota-based artist Mike Menasco, painted it. “As a direct result of the Fossil Freak Show videos, I have standing invitations to go fossil collecting to locations around the world,” adds Miller proudly. Last summer, Bryant and Miller were invited to take an all-expense paid trip down the Athabasca River, Alberta, sponsored by Darcy and Shirley Zelman of Grand Rapids Wilderness Adventures. They traveled by jet boat from the City of Athabasca 150 miles downriver to Grand Rapids. No amazing discoveries were made but they did collect a few small artifacts and fossils, saw a lot of wildlife, enjoyed the scenery, had plenty of fun, and were able to create several YouTube videos of their adventure. This year, Miller is going solo and branching out with his own unique brand of fossil fanatic photojournalism. With the assistance of volunteer webmasters and videographers Michelle Salmon and Shane Eigler, he has new videos in various stages of production and has recently launched a new website: www.skippysfreakyadventures.com. Miller dreams that one day Skippy’s Freaky Adventures will be “discovered” and that he could become the next reality TV sensation, like Survivorman or Mantracker. “That would be just freakin’ AWESOME! Wouldn’t it?” exclaims Miller. Until then, Skippy Miller will continue to scan the beaches of Vancouver Island for pre-historic starfish and dream of stardom. He will gather fossils in a bucket, fans on the Internet and hundreds more Facebook friends. And I guarantee you he will be having fun! his eyes are bulging and his tongue is sticking out. It’s hard to tell whether he used Photoshop to rotate his image or the photo was taken while he was skydiving or falling off a cliff. With Miller, anything is possible! it was the efforts of two local amateurs that would bring the region to the attention of the world. In late November of that year, Mike Trask and his then 12-year-old daughter Heather were prospecting for fossils along the Puntledge River just west of the city. Mike was advancing in the lead, kneeling every few metres to examine a particular fossil and to mark it with chalk, for later extraction by Heather, who was following close behind. Suddenly, as she examined a fossil that her father had just outlined, Heather noticed a group of concretions rising from the exposed shale less than a metre away. Upon further excavation, both she and Mike were astonished to discover a group of fossilized bones from some great beast, as-yet unknown and extinct since the end of the Age of Dinosaurs. After months of investigation and correspondence with scientists at the Royal Tyrrell Museum in southern Alberta, their discovery proved to be the first Elasmosaur recorded in British Columbia—the first of its kind west of the Canadian Rockies. At the heart of the subsequent activity around this discovery was the Courtenay & District Museum, which was, up until then, a small community museum. Within months of the marine reptile’s discovery, the museum had made the Elasmosaur location a provincial heritage site. Two years later they excavated the rest of the creature with the help of staff and numerous volunteers. Since then, the public has expressed a growing curiosity in this science in general, and in the other large extinct reptiles that have been discovered, including the Mosasaur. Today, the museum stands at the forefront of the exploration of more than 400 million years of prehistory on Vancouver Island. Numerous programs and projects continue to encourage and support the amateur earth scientist in all of us. The Museum also offers a popular Fossil Tour program for all ages from April through August, as well as kid’s camps in July and August. The adventure includes a brief lecture and video about the famous discoveries made in the local area and a tour of the exhibit galleries to see the reconstructed cast of the Elasmosaur and other fossils. After that you will head to one of the many beautiful fossil sites along the Puntledge River where you experience the thrill of hands-on discovery as you search for a fossil of your own.